Curiosity spent its first Christmas on Mars on "Grandma's House," a previously unexplored part of Yellowknife Bay in the Gale Crater. Image taken Dec. 12, 2012. The Curiosity rover is currently parked inside Yellowknife Bay, a shallow depression of odd terrain nestled inside the rover's vast Gale crater landing site. "Grandma's House" is an informal name for Curiosity's holiday spot inside the bay, rover team member Colette Lohr said in a NASA video. Yellowknife Bay, a 2-foot-deep (half-meter) basin, is an interesting spot for Mars scientists because the area contains terrain unlike any yet seen by the Curiosity rover. Mission scientists are studying rock targets in the region in order to pick one for Curiosity to drill inside. Curiosity has been studying the region using its mast-mounted cameras and laser, but the ultimate goal is the first trial of the rover's percussive drill. The instrument is designed to drill inside a rock and collect the powdery rock sample from the interior so it can be analyzed by other onboard tools — something never-before attempted on Mars, NASA officials said. The drilling test is set for early in 2013. On Dec. 17, Curiosity made it to Yellowknife Bay, a previously unexplored part of Mars. NASA's Mars rover Curiosity landed on Mars on Aug. 5 to begin exploring the Red Planet. 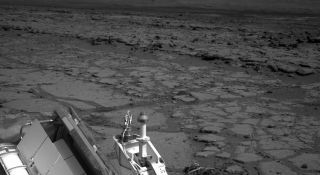 The $2.5 billion rover's primary mission is to determine if its Gale crater landing site could have ever supported primitive microbial life. Curiosity is currently driving toward a spot called Glenelg near the base of Mount Sharp, a 3-mile (5 kilometers) mountain that rises up from the center of its Gale crater landing site.